This week Adam and I look at three key questions facing the Green Bay Packers this week, as they head south to play the up-and-coming Cincinnati Bengals at Paul Brown Stadium. Our analysis includes talk of the Bengals defensive line, the Packers running game and A.J. Green. 1. The Bengals defensive line is said to be one of the best in the NFL, while the Packers boast one of the smallest and youngest offensive lines in the league. 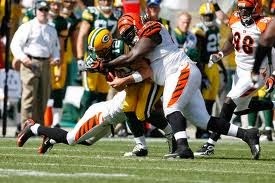 How many times does Rodgers get sacked and how concerned should fans be about this clear advantage for Cincinnati? Will this image be a reoccurring theme Sunday? Adam: I would expect McCarthy's game plan to focus on the short passing game to get the ball out of Rodgers hand early. Once Rodgers gets into a rhythm the no huddle offense is another pass rush neutralizer that can limit substitutions and wear the Bengals down. I think Rodgers get sacked 3 times on Sunday. I'm not really concerned about the pass rush. Despite their elite pass rush the Bengals haven't shown the ability to get stops in key situations this season and I expect Rodgers to make plays when he has to. Furthermore, if the Bengals think they can get away with as much man coverage as they played against the mediocre Steelers receivers Monday night, they're in for a long day. This is a game where McCarthy reminds Packer fans that he's one of the elite coaches in the NFL with a winning game plan against a strong team on the road. Shane: The Packers shouldn't be taking this defensive line lightly. Especially being on the road with two very young and inexperienced tackles, expect Rodgers to be on the run tomorrow. I wouldn't be surprised to see him have 3-5 carries for 25-50 yards. 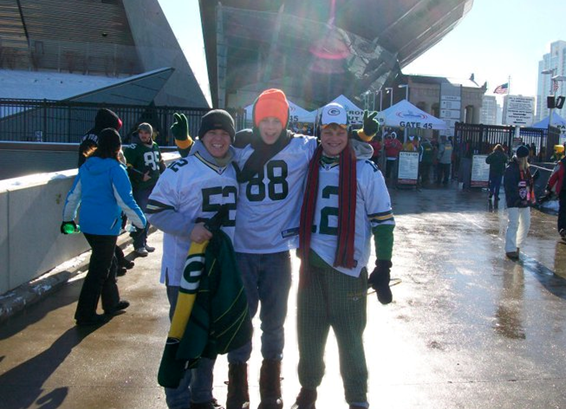 Hate to say it, but the Packers are over matched and if Rodgers doesn't have time to throw, nothing else will matter. At the same time, if McCarthy can adjust the game plan to include more short throws, the Green Bay wide receivers could have another huge YAC day. I'd like to see Randall Cobb line up in the backfield a little more and I think it's something we could certainly see in this game. Rodgers gets sacked three times, but is hurried and hit a few more times than fans would like. 2. Assess the Packers running game going into Sunday and how they'll perform. How much action will Franklin see and will Lacy even suit up? Adam: If Lacy is cleared to play I think the Packers would activate him with the intention of only playing him if something happened to Starks. Starks earned the opportunity to carry the load and I don't think the Packers want to rush Lacy back in a tough situation. Best case scenario Lacy gets 30% of the snaps and touches the ball 7 times. Franklin hasn't shown any explosiveness or reliability in pass protection. Considering the aforementioned Bengals pass rush, it's not the best game to test the waters with Franklin. I don't expect the Packers to have much success running the ball in this game. Shane: It will be a tough day for the Packers running game. But they have to stick with some level of balance to keep the defense honest. I think the plays that will work are delayed hand-offs from the shot gun and pitch out plays meant to get our RBs to the edge and speeding past the Bengals big defensive line. That being said, I think Jonathan Franklin gets a surprising amount of snaps in this game as more of a flanker back. Franklin can't block for a lick so they won't ever leave him back to protect Rodgers. Franklin will fly out for a few screens and look to turn the corner on outside runs, similar to the way UCLA used him in college. This is the game to use Franklin and fans might be surprised to see him be productive in this offense. Lacy suits up but isn't used except in an emergency situation. 3. How will the Packers approach A.J. Green? Will they stick to their "new philosophy" of keeping CBs to their sides, or will Tramon draw the 1-on-1 assignment? Either way, predict Green's production and how effective you think the Packers can be in stopping him. Adam: I'm interested to see the game plan here. I trust Tramon to make things difficult and shadow Green across the field. A.J. Green is a freak of nature and is going to get his. I fully expect Green to go for 100 yards and touchdown. I think the key to consistently stopping the Bengals offense will be preventing Dalton from attacking the middle of the field with his two pass catching tight ends. The Bengals have run a huge percentage of offense plays this year with both Jermaine Gresham and Tyler Eifert on the field. The Packers linebackers and safeties will have their hands full down the middle of the field and need to limit Dalton's effectiveness throwing between the numbers in order to get off the field on third downs. Shane: I'd actually like to see Sam Shields get the 1-on-1 assignment on Green all day. Shields has been the Packers most impressive secondary player and he's already surpassed Tramon as the Packers number one cover CB this year. But I don't think that will happen. Both Tramon and Shields will get their shots on Green, but the Packers won't exclusively shadow Green with a single guy. That will be a mistake. Green will be especially productive out of the slot and working the soft zones in the middle of the field--the Packers' biggest weakness. I predict Shields has a least one INT and probably a few more pass-breakups, but Green still goes for 8 catches and 100+ yards. Which Redskins player should the Packers should be MOST concerned about beyond RGIII (offense or defense)? Adam: Pierre Garçon is their big play wideout. They rarely lose when he goes for 100 yards and a touchdown. Shane: Alfred Morris. He's a big play back who could help the Redskins control the time of possession and keep the ball out of Rodgers' hands. Expect a hefty workload from him and for Shanahan to stick with the running game. What's the key to stopping the Redskins offense? Adam: Need another strong performance in the trenches to control the ground game and Alfred Morris. The Redskins offense is predicated on the pass-run option out of the read-option. If the Packers can limit the ground game I'd like to think RGIII isn't ready to throw for 400 yards without making some mistakes like he did against the Eagles in week one. Shane: Stopping Alfred Morris and the Redskins running game. To do this, Green Bay needs to score early and often. They must get a lead early and force the Redskins to pass the ball. It's a difficult task considering Mike Shanahan is pretty dedicated to the run game. Mitch: Put pressure on RGIII. Take pressure off our secondary. Adam: I think Lacy showed he's ready for 20 plus carries and around a 100 yard performance. Ball control hasn't been the Packers strong suit the last few years because of an ineffective run game. Pound the rock, control the clock and keep the D fresh to lay the wood to RGIII. Shane: Jermichael Finley bounces back from his fumble to catch at least two big plays (30+) down the middle of the field, tallying 100+ yards for the game. Mitch: James Jones catches two touchdowns. Run game will still be iffy. Adam: 31-17, Packers. Lacy goes for 90 yards and a touchdown. Redskins have an aggressive pass rush. I'd like to see Lacy with a few nice screens slipped in behind an over-pursuing defensive line. Shane: 34-14, Packers. Aaron Rodgers is relentless throwing the ball down field and connects for multiple big plays to Finley, Cobb and Jones in throwing four TDs and 350+ yards in an early season beating of the unproven Washington Redskins. 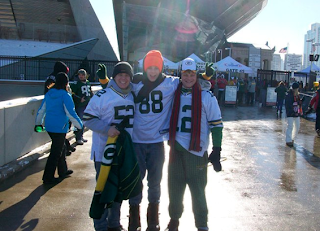 The Packers have won 20 of their last 21 at Lambeau and that record will improve Sunday. 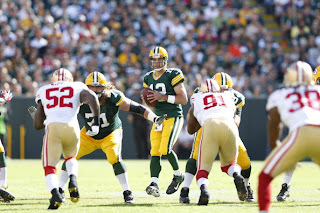 Questions concerning the Packers roster were answered during their 34-28 loss to the San Francisco 49ers last Sunday. No matter how many times the Packers made a statement on the field, the 49ers were able to reply in a repeat fashion of last years playoff loss last January. Quarterback Colin Kaepernick was 27 of 39 for 412 yards and 3 TDs in a shoot-out with Packers QB Aaron Rodgers who was 21 of 37 for 333 yds. Probably the best positive for the Packers was how well Rookie OT David Bakhtiari protected Rodgers’ blind side. Linebacker Aldon Smith did create pressure on Bakhtiari throughout the game and did sack Rodgers twice. For a weak offensive line to handle what is arguably the best defensive front in the League was somewhat encouraging. The Packers defensive line is the most positive story out of the defense. Johnny Jolly, Datone Jones and B.J. Raji were able to put decent pressure on Kaepernick and kept Frank Gore to only 44 yards rushing. This opened up holes for linebacker Clay Matthews to make sacks and tackles behind the line of scrimmage and in the end prevented the 49ers from using the read-option effectively. Oh boy… the secondary. Let me start by saying that the Packers defense was successful at stopping the 49ers read-option. They were, however, unable to stop Anquan Boldin. ; the 11-year veteran had 13 reception for 208 yards. Boldin was running laps around Safeties Jerron McMillian and M.D. Jennings for the entire game. Embarrassing as it was, the Packers secondary was never able to adjust. Fourth year veteran Safety Morgan Burnett and second year play-maker Casey Hayward were greatly missed in this game and it hurts to think what these two might have done differently in the situation. Let’s stop for a moment and realize that Packer’s running back Eddie Lacy is a rookie and he is bound to make mistakes. But the fumble was a game changer. 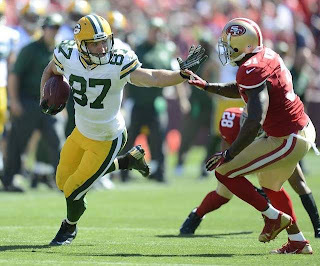 The Packers offense was starting to pick up the pace when Lacy made a crucial fumble recovered by the 49ers. This offset the score and the Packers played catch-up for the rest of the game. Both the defense and the offense need to work hard at making plays on 3rd downs. Yes, the offensive line was pressured the whole game and prevented many sacks, but the receivers need to catch the balls. 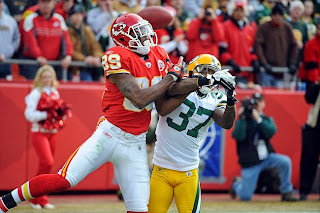 Wide receiver James Jones was targeted twice and failed to catch either of the passes when it mattered. 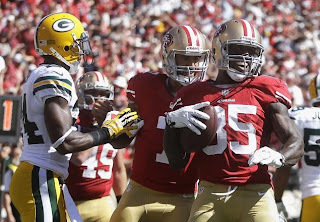 The 49ers best plays occurred when they were facing a 3rd down against the Packers defense. The 49ers played extremely well between the 30’s and were able to convert more than half their 3rd downs. 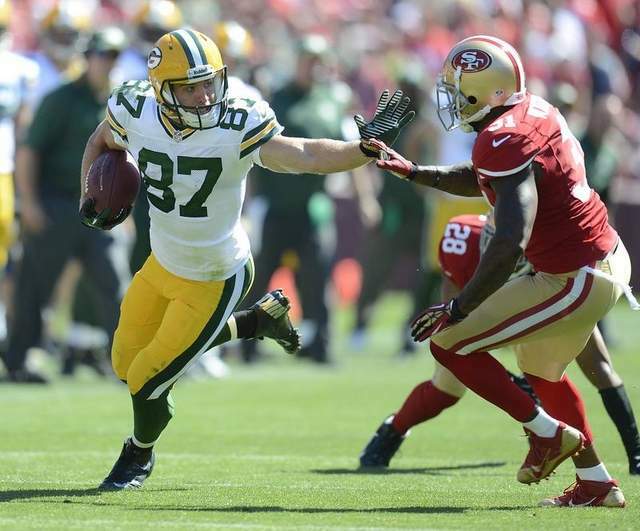 If Jordy Nelson and Clay Matthews can stay healthy, they’re both going to have career years. I expect the sack numbers to fall for Aaron Rodgers if the Packers offensive line can hold up to defenses as good as San Francisco’s. We have a run game in the works. Even with no holes at all, Rookie Eddie Lacy was able to grab yardage. If this offensive line can make slightly bigger holes for Lacy, he might be unstoppable. Expect Lacy to only improve as the year goes on. The offense shook off its rust and proved it’s still as dangerous as ever. If the packers lose games this season, they will be very close games. The 49ers are possibly the best team in the NFL and if the Packers can keep it this close with the best, fans can look forward to many wins against the rest of the league. Watch and learn Sunday afternoon because Packer fans will get answers to many of their offseason questions and concerns. The 49ers are the most complete, talented and physical team in the NFL and this matchup will directly dictate the entire fate and trajectory of Green Bay’s season. Here’s how and why. Can the Packers offensive line keep Aaron Rodgers upright? Will they be able to defend the read option and running quarterbacks? Will be able to block for Aaron Rodgers? Will the defense be able to stop anyone? Will they find a solution at running back? The 49ers will push Green Bay in each of the above categories, giving Packer fans a sense of the progress (or lack thereof) the team has made in the offseason. What I’m most interested in though beyond these specific factors, is the coaching matchup. Week one is the culmination of thousands of hours, hundreds of days and multiple months of preparation. Mike McCarthy and Dom Capers are square in the spotlight, after an embarrassing lack of preparation was evident the last time these teams met. Personnel issues are one thing, but this football team better be prepared appropriately and there better be a sense of nasty in the eyes of Packers defenders. If the Packers fall flat at San Francisco again, the season story line will constantly shadowed by the idea that the Packers can’t play with the NFC elite. If the Packers play well, the team will have a renewed sense of hope and confidence as it moves forward into the league’s 6th most difficult regular season schedule. No matter the outcome, if I see all of the above Sunday afternoon I’ll feel pretty good about this team. That being said, here’s my game prediction. Green Bay’s defensive line proves surprisingly stout against the league’s best offensive line and forces Colin Kaepernick to be a true pocket passer for 90% of the game. He still torches the Packers with one 30+ yard TD run, but also throws two INTs, fumbles once and is unable to find enough open receivers to pull ahead of the Packers. Rodgers gets the ball back tied with less than a minute on the clock and leads his crew on an impressive drive, mainly targeting Jermichael Finley to get Mason Crosby a 51-yard FG attempt to win at Candlestick. Crosby drains it and the Packers start 2013, 1-0 with a 27-24 defeat of the defending NFC champions.